The Mike Clink-produced sophomore effort showcases the band's own frenetic brand of metal. In an effort to help protect the future of the species, the company has planted 1,500 of the near-endangered trees in Cameroon’s Congo Basin region. Support for the shows will come from Crowbar, Lo-Pan and Quaker City Night Hawks. Kevin from Said Too Much Productions 3D-printed his way to a soprano guitar. 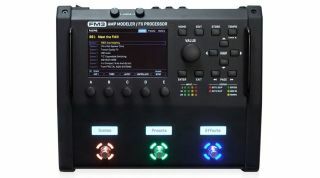 Behold, Fractal Audio's New FM3 Compact Amp Modeler/Multi-Effects Pedal The Axe-Fx III's ARES amp modeling is built into the FM3, giving it more than 265 models and well over 2,000 speaker cab impulse responses and user locations. Steve Vai Left Speechless After Dueling with a Brazilian Fan A fun, spontaneous moment shared by two super-talented guitarists. Melodic Phrasing and Playing Over Blues Changes Learn some more about melodic phrasing from Testament's Alex Skolnick! How to Build the Ultimate Pedal Board Are you a pedal-board dunce? Fear not! In this illustrated tutorial, Guitar World shows you everything you need to know. New line of basses incorporates the sleek and ergonomic design the company is known for. The Ironman II features 18 attenuation settings that adjust the amount of power sent to the speakers. This video might be particularly helpful for guitarists who are looking to branch out from the more traditional singlecut Les Paul shape and sound. A few basic guidelines to consider when putting together a rig, whether you want to play jazz, blues, classic rock or metal. Gruv says its new hardcase is the "world's most advanced travel guitar bag." The updated, hand-wired pedals are now more pedalboard-friendly, feature printed circuitboards and have UV-printed graphics on their powder-coated enclosures. A yard sale can be the perfect place to scope out some six-string bliss. HeadRush's latest creation features a quad-core processor, 12 footswitches and a 7" touch display. Beatles-inspired stompbox offers vintage British tube amp-style gain. Compact pedal offers soft switching, effects loop, adjustable volume boost and more. An all-too-brief guitar shoot-out featuring Cacophony guitarists Jason Becker and Marty Friedman. As an electric guitarist, Clarence White built the bridge between country and rock in the late Sixties. Planning a road-trip to the desert? Keep these tracks in mind when assembling your playlist. Watch Miguel Márquez employ 45 different techniques in one guitar solo. Tharpe's remarkable musical legacy is undoubted by those who know of her impact on modern music. Peter Frampton re-imagines one of Soundgarden's greatest songs. Eddie Van Halen shares his favorite guitar riffs—but not before asking if he could mention some of his own. There aren't too many "shred guitar" videos from 1965, but this one—featuring Glen Campbell and Phil Baugh—certainly qualifies.